The Night Owl Caf� returns to the Adventist Ministry Convention! Sunday, January 15- 9:00 p.m. - 11:00 p.m.
Monday, January 16-7:30 p.m. - 9:30 p.m.
Tuesday, January 17-7:30 p.m. - 9:30 p.m.
Reading: Why is Christmas in December? Quotes: "Anyone can do any amount of work provided it isn't the work he is supposed to be doing at the moment." In my churches the Lord's Supper is reserved for the last month of each quarter. As I've been conducting it this month, I noticed again the number of people who choose to not participate in the foot-washing service. Even in a church that I'd describe as fairly traditional, there were more people in the sanctuary than in the rooms set aside for the service - and after the foot-washing, it was clear just looking at the pews that quite a few had used the "break" to slip away from church. So I did an informal survey. "Why didn't you go to the foot-washing service today?" "I didn't know this was communion day, so I wasn't prepared for it." "I can't get down to the floor to do it." "It just disrupts everything for me to get up and walk to another place, and I lose the mood of the Lord's Supper." "I'd have to take off my hose." "I've got some really gross toenails, and it embarrasses me." "I just don't like it. Very uncomfortable for me. Have to talk with and touch someone I don't know that well." "We're visitors here. We don't know anyone." "I hate looking for a partner." What to do with the foot-washing service? One of my church leaders said, "We need to push people to do it." (Not easy to do. In my way of thinking, it's a very personal thing.) Someone in the foot-washing room said, "Maybe people don't understand what it means." (If they don't, it's not for lack of explanations.) Someone asked, "If a person doesn't do foot-washing, are they allowed to take the Lord's Supper?" (I couldn't find an official answer, but I've never stopped anyone.) As for finding a partner, I'm not inclined to blame unfriendliness: those in the men's foot-washing service, at least, tried to make sure everyone was served. The foot-washing service is explained in our Fundamental Beliefs as a "renewed cleansing," "willingness to serve one another," and "unit[ing] our hearts in love" - all areas where every Christian and congregation could use help. The Church Manual explains the preparation for and importance of the ordinance, but it doesn't talk about what we should do when people don't participate in it. Is there waning interest in the foot-washing service? How important is it to your church? What have you done to address it? Discuss this on our Facebook page. The Greatest Gift is a graphics package available as a courtesy download from SermonView. 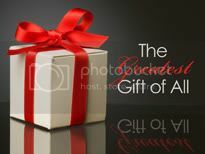 This image set comes complete with the primary image plus pre-built composition slides for easy customization. You'll receive both a PowerPoint file and jpg files for easy use with any worship software. It's hard to imagine how God actually became a flesh and blood human being. 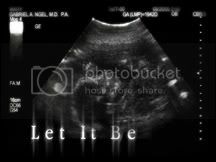 This graphics package entitled Let it Be portrays the incarnation in the form of a sonogram. The complete package contains a short movie, a slide package and a scriptural reading. The graphics package was first featured on Pastor's DVD Volume One but is out of print. If you don't have a copy of PDVD1 I will send you the complete package via email. Just contact me at dave@acn.info. Still telling people that Christmas is in December because the papacy piggybacked on to pagan winter solstice celebrations? That was the Cromwellian explanation, but it may not be wholly true, according to some scholars. Have you experienced a bad pastoral search committee process? You're not alone. Here are some great suggestions for search committees that should be required reading for every search committee member. Send this to the church that's interviewing you! Are we way too pessimistic? Is the world really that bad? Bradley Wright doesn't think so. Great piece to contemplate with your outreach committee as you think about how you approach evangelism. Quote: "You'll find that contrary to popular opinion, life is improving in many ways (though certainly not all), and this improvement is nothing short of remarkable." A great story of total generosity, no hooks, and a response way, way beyond what was expected. Alvin Plantinga is still sticking up for God, in spite of being one of the world's most recognized philosophers. Quote: "Mr. Plantinga readily admits that he has no proof that God exists. But he also thinks that doesn't matter. Belief in God, he argues, is what philosophers call a basic belief: It is no more in need of proof than the belief that the past exists, or that other people have minds, or that one plus one equals two." Always proud of our government when I hear of our leaders working to protect basic religious freedoms. From the "you didn't think of that when you did it?" department: Laser tattoo removal is big, and at least some of it has to do with people's faith. Humor: The 86 year Bible-reading plan. Start now! Another new Facebook page for pastors' spouses. Humor: Ever heard preaching like this - that dwells on the negative and won't celebrate the good news? Buzz: Preview Joshua Harris's new book Why Church Matters. The ACS Outreach Leadership Conference is sponsored by the Adventist Community Services - Washington, the North Pacific Union Conference and NAD Adventist Community Services. It will be held at the Washington Conference Office in Federal Way, Washington on March 2-4, 2012. Participants will hear challenging speakers and choose from 30 training seminars. For registration and more information: www.washingtonconference.org/ACS.